Here we show you the parts used to build a screen room and a little how to knowledge. Screen room parts are really quite simple and they are all used in this example. This page will explain the parts and the photographs will tell the how to story. The photos used to illustrate this page about screen room parts are all enlarged by clicking on them. This is a screen room being framed. The bottom channel is called screen room slip channel. It has several uses. We use long channels of this at the top and bottom of our screen rooms. At the corners we miter the channel for a neat appearance. The slip channel is also cut into 2" pieces and used for brackets to hold the 2" x 2" screen extrusion. The 2" x 2" screen extrusion is used for most of the places you plan to install screen. In this photo it is used at the bottom of the screen bay. The screen will attach to this as well as the kick plate. Some screen rooms also have a chair rail that can also be made of the 2 x 2 and attached the same way as in this photo. It is set at about 36" from the floor and adds a little interior protection for the screen. 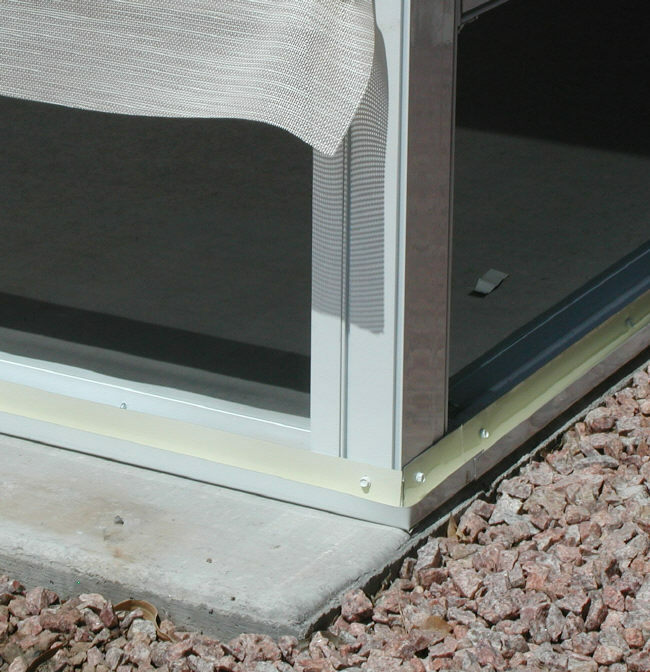 The 2 x 2 is also used as the vertical supports that separate the bays in the screen room. This photo shows the last screen room part used in the framing. It is the 1" x 2" screen extrusion. In this illustration it is on the back side of the corner. A 1 x 2 is used anytime the 2 x 2 screen grooves point one direction and you need to add a wall going in a different direction. A 1 x 2 can be attached to a 2 x 2 to add a screen groove going in a new direction. This 1 x 2 is also used in place of a 2 x 2 for a chair rail. It is less expensive and serves the same purpose. This view shows the slip channel at the top. The 2 x 2 posts and inserts have been installed. The awning posts have also been removed from this awning. This makes a nicer look overall and makes screening much easier. Now we are ready to roll in our Suntex 80% sunscreen in the stucco color. The screen is being rolled in and the aluminum skirting bottom track is in place to hold the kick plate. 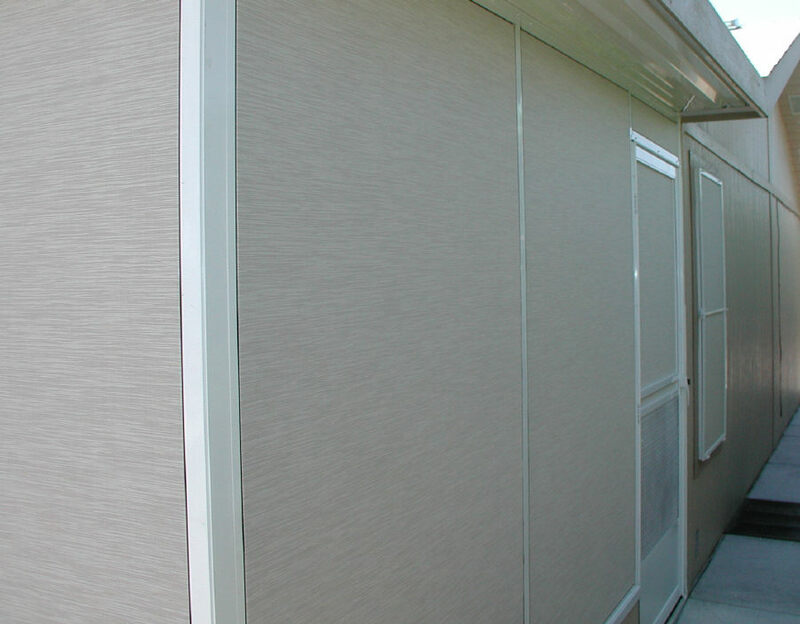 This screen room gets painted hardboard inside and out to match the look and color of the home. After the boards are cut and painted they go into this skirting bottom track. Skirting top track is then used over the top for trim. This photo shows the skirting top track and the hard board siding in place. See how well this continues the look of the home. 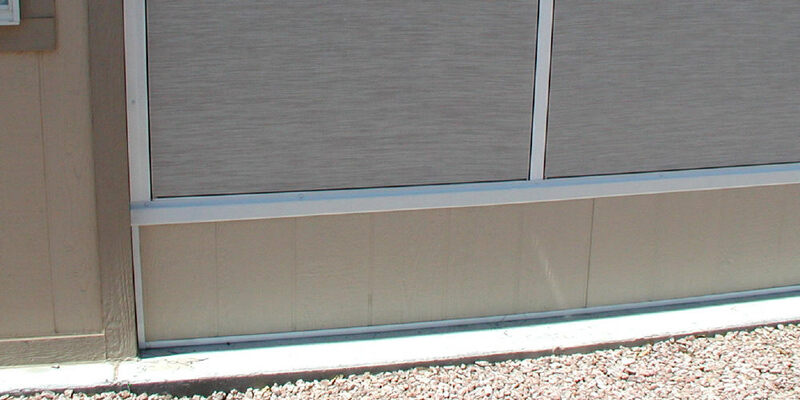 Skirting kick plates can be made out of just about any type material. 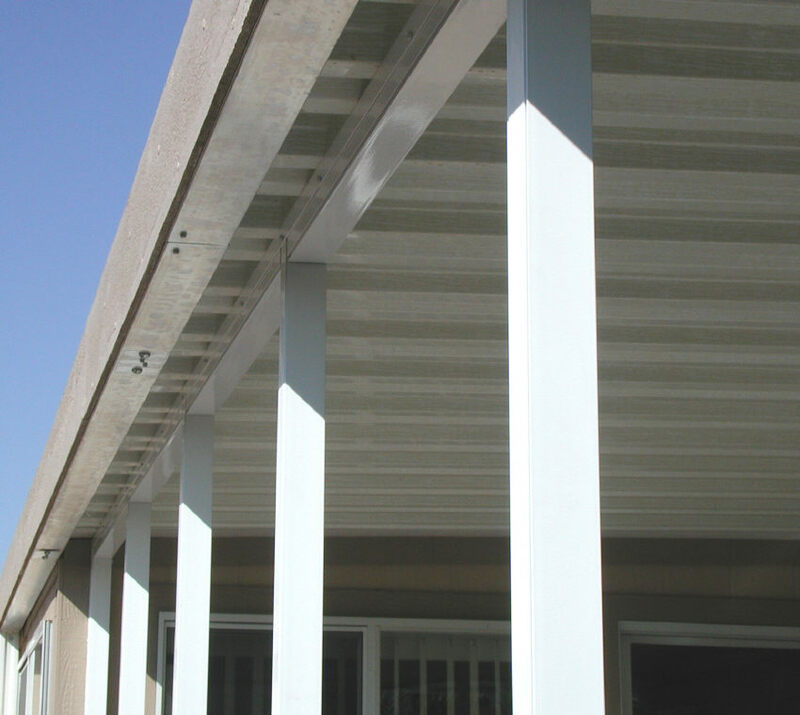 We use vinyl siding, vinyl skirting, aluminum skirting or hard board siding in most cases. The inside of the room can be left open or for a more finished look it can be done to match the outside. In this case both sides were done. As our screen room nears completion the Suntex shade screen is being held in place with screen spline. 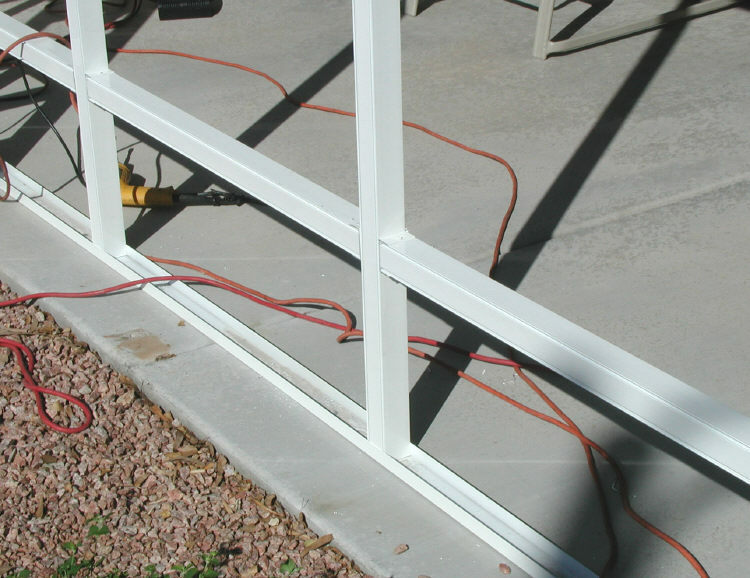 After the spline is installed we trim the excess screen with a utility knife. 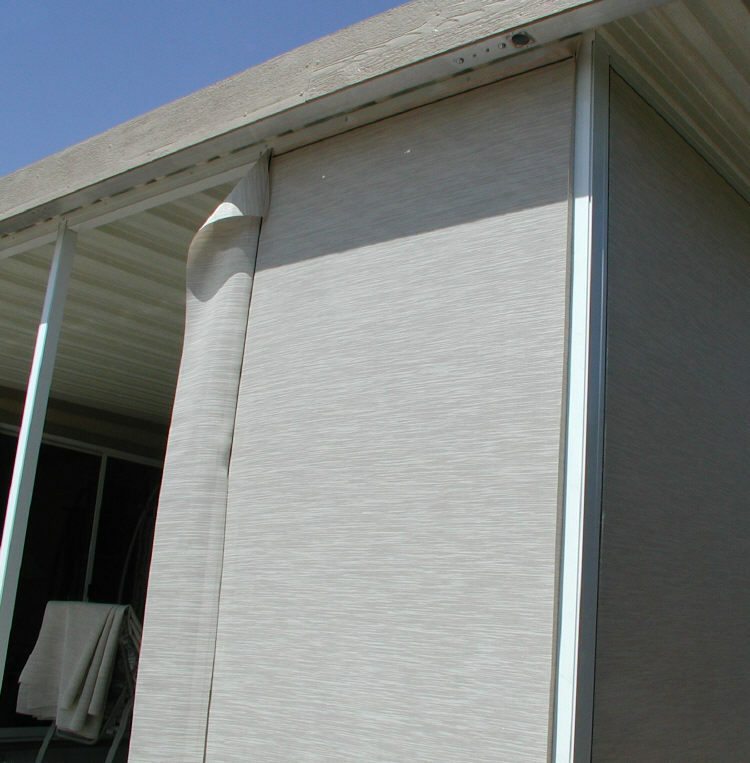 We use Suntex shade screen in a lot of our screen rooms. It is more expensive than bug screen but much needed to fight the afternoon sun in Mesa Arizona. The homeowner can sit in her screen room and still have a great view of the mountain. She wanted privacy without losing her great view. She is well pleased with the results as are her neighbors and friends. 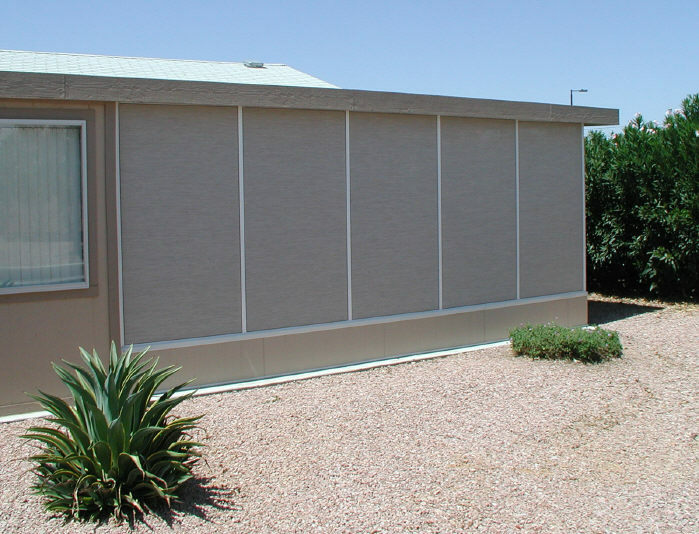 We build the best screen rooms in Arizona, let us offer you a free extimate.